Main Street on Obama's jobs act: Nice. Blech. Huh? 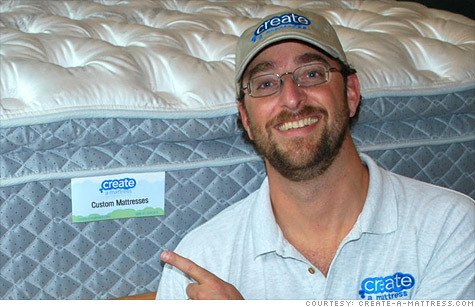 Create-a-Mattress.com owner Evan Saks said the proposed payroll tax credit is a "drop in the bucket" compared to plunging consumer demand. NEW YORK (CNNMoney) -- Some were optimistic. More were highly skeptical. And others were left scratching their heads. That's how some small business owners felt about President Obama's jobs package, which was unveiled Thursday. Obama's $447 billion stimulus plan is a combination of tax credits and spending initiatives aimed at boosting the stalled economy and creating jobs. So small businesses, which have generated about two-thirds of the nation's new jobs in the last 15 years, were particularly interested on how the proposal would work for them. If the bill, called The American Jobs Act, were passed, it would cut the payroll tax businesses pay in half -- to 3.1% -- on the first $5 million in wages. Also, if a business hires a new worker or gives an existing worker a raise, all payroll taxes will be waived. The act would also extend a tax benefit allowing businesses to write off their expenses more quickly. And while the president made a nod toward reducing the regulatory burden on small businesses to help them obtain capital, there weren't many specifics for business owners to whoop and holler about. Main Street: Miffed and skeptical: Tax credits are nice -- for businesses that are already hiring or expanding -- but they aren't going to motivate small business owners who don't need more employees to hire. "Jobs are created when businesses have access to consistent cash needed to make payroll," said Chris Zane, the owner and founder of a bike shop in Branford, Conn. "I would have liked to hear about a plan that would provide incentives to the banks that open up their vaults to creditworthy small businesses." David Levine, the president of Wireless Environment, needs access to capital, too, to be able to ramp up his payroll. "We -- and many other small businesses -- could create many more jobs around our innovations if the banks went back to lending money," he said. Many small businesses also want more consumers to start opening up their wallets again. "Small businesses like mine are in a daily struggle for survival -- we need immediate relief!" said Evan Saks the founder of Create-a-Mattress.com, a custom mattress online retailer with three employees. "Payroll tax incentives are a drop in the bucket against the backdrop of historic industry wide sales declines," he said. Consumer spending is also a top concern for Marc Rothenberg, the president of Intercept Silver & Jewelry Care Company. Payroll taxes don't impress him. "If consumer demand does not increase, owners will not need to hire and they will just 'pocket' the extra savings," he said. Then there was doubt that Congress would actually pass the proposed law. "The tone was forceful, and I agree with most of the initiatives in principle," said Saks. "But we've seen all these ideas before, and the political reality is expecting cooperation from this Congress is wishing for dancing fairies riding unicorns on rainbows. They can't agree that grass is green." Main Street: Encouraged and hopeful: "I felt the recognition of small business as what drives this country's economy was tremendous," said Anton Semprivivo, the general manager and vice president of the Honda dealership in Toms River, N. J.
Semprivivo said that he liked the proposals to cut payroll taxes, give businesses tax credits for hiring the long-term unemployed, and the effort to reduce burdensome regulations. Zalmi Duchman, the owner and CEO of TheFreshDiet.com, said he also liked the proposal to cut his payroll taxes. With 300 employees, a payroll tax credit could really add up. "Although I was hoping to hear him say he wants to cut it completely, I was not expecting him to say it at all," said Duchman. "Cutting our payroll taxes in half for 2012 can be a big boost for us, and I am sure other small businesses." Duchman was curious to hear the president indicate he will be working to decrease regulation. Although, barring much in the way of specifics, Duchman was cautious: "How exactly will he accomplish this? To me, it seems impossible." And, despite his critiques, Zane was generally impressed with the President's resolve. "I was impressed! Not necessarily by any one specific point, but by the fact that the president's jobs act seemed to be balanced and reasonable." Meanwhile, some small businesses are still trying to understand what the whole speech means for them. "We, at Baked, are not quite sure how the new initiatives will help us directly," said Matt Lewis, a co-founder at the Brooklyn-based bakery. "We still need time to piece the information together."